blog, he is also the author of The Ancestral Table, and the new cookbook, Paleo Takeout: Restaurant Favourites Without The Junk, which I am thrilled to be reviewing for you today. I cannot sing enough praise about this book. Seriously. Five years ago when I transitioned to the SCD, and later to more of a paleo or real foods diet, I thought I had given up things like Chinese, Japanese and Mexican foods forever. Russ has changed all of that with this book. I know. Amazing. And what’s even more amazing is that I get to share this Burrito Bowl Date Night recipe from the book with you. And trust me you will want to make these. Like now. Erik and I inhaled these when I made them a couple weeks ago. It was a good thing I got good photos the first time, because there were definitely no leftovers in case I had to re-do them. They were that good. But first, before you get to the recipe I wanted to give you a more complete look at just what you will find inside of Paleo Takeout. So what will you find inside Paleo Takeout? Lots. There are over 200 recipes inside, and they are broken down by section into all your favourite take-out genres: Chinese, Japanese, Korean, Thai, Vietnamese, Indian, Filipino, American, Italian, Mexican and Greek. Yes, whatever food craving you are having, you are sure to be able to satisfy it with this book. And most of the recipes take less than an hour to make, because let’s be honest, the whole point of take out is to make life easier right? Russ didn’t want you to be slaving away in the kitchen just so that you can enjoy the foods you miss and love. Recreations of your favourite fast-food chain dishes. Without mentioning restaurant names, dishes like fried chicken, burrito bowls, chicken nuggets and so many more! Is your mouth watering just thinking of some of those dishes? I hope so! Since we all know that most of the restaurant foods we love are filled with unhealthy ingredients, chemicals and additives Russ wanted you to be able to still enjoy those amazing flavours, but to do so using real, nourishing ingredients. 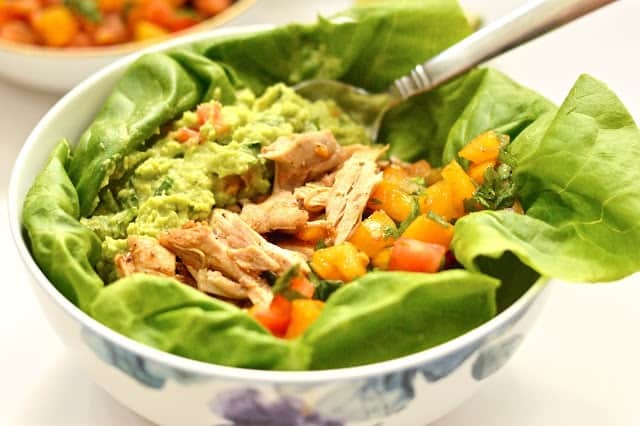 Just because you are eating healthy doesn’t mean you have to give up your favourite foods! Not any more anyways. Paleo Take Out has made that possible. If you are interested in learning more, or in getting your own copy of Paleo Takeout, simply click here. 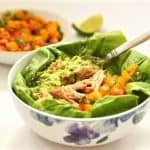 I know there are a lot of paleo cookbooks out there, but if you are really looking to re-create some of your old favourite dishes, there aren’t any other books out there that do that (trust me I have a whole cupboard full of paleo cookbooks). 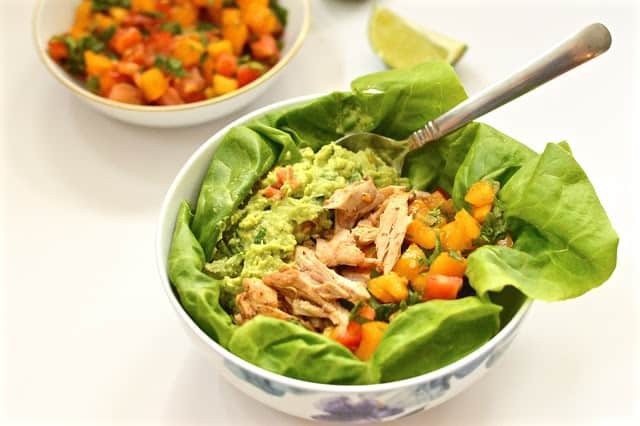 And don’t forget to check out the recipe for the Burrito Bowl Date Night which you will find below. Until next time, happy eating everyone! Place the garlic, olive oil, chipotle chili powder, vinegar, lime juice, salt, pepper, paprika, and oregano in a blender and blend until smooth. Combine with the chicken in a resealable plastic bag; marinate for at least 30 minutes, overnight preferred. Make the Pico de Gallo: Salt the diced tomato; leave in a colander to drain for 20 minutes. Combine the drained tomatoes with the remaining ingredients and set aside. Grill the chicken over direct medium-high heat until it reaches an internal temperature of 155°F, about 10 minutes, flipping halfway through. Let the chicken rest for 5 minutes, then chop it into bite-sized chunks. Make the Cilantro Rice: Place the cooked rice in a big bowl. Mix in the oil. Add the lime and lemon juices and salt, stirring together. Finally, stir in the cilantro. Taste and add more salt or lime juice if you like. 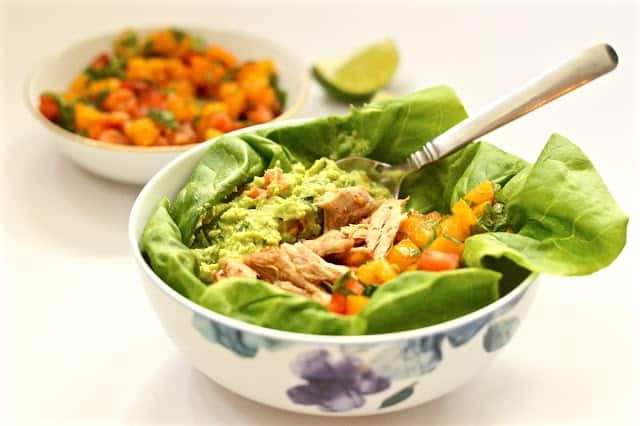 Serve the burrito bowls any way you see fit. At my house, we like rice, then lettuce, then chicken, then pico, then guac. * If making the cilantro rice with cauliflower rice, only use half of the wet ingredients (oil and juices). * If serving with sour cream, vigorously stir the sour cream to denature its proteins and make it less firm. * If serving with cheese, an equal mixture of white cheddar and jack cheeses tastes best. * Don’t limit yourself to just chicken. Consider using Carnitas (page 250), fajita steak (page 248), or blackened fish (page 252). * You haven’t really lived until you’ve made a burger bowl: unseasoned cooked rice, Mayo (page 276), Ketchup (page 278), mustard, your favorite burger toppings, and a burger or two on top. You’re welcome.